Mushroom Risotto ~ a voluptuous but easy risotto made with mascarpone cheese, cognac, and both wild and cultivated mushrooms! Place the dried mushrooms in a small bowl and cover with warm water, according to the package instructions. When they have reconstituted, drain them and give them a rough chop Set aside. Clean your fresh mushrooms with a damp towel, or, if they are very dirty, give them a quick shower. Pat them dry and then trim and slice them. Put the fresh mushrooms in a dry saute pan and cook them over medium heat until they start to release their moisture and darken. Stir often so they don't stick. When the mushrooms are cooked through, turn off the heat and set aside. Put the beef stock and the water in a saucepan and heat to just under a simmer on the stove. I like to add a few thyme sprigs so they will infuse flavor into the stock as it heats. In a heavy stockpot, melt the butter and oil and saute the shallot and garlic for about 5 minutes over medium low heat, do not brown them. Add the rice and stir to coat. Saute another minute or so, stirring constantly. Add the cognac to the pan and stir until it is absorbed. You should hear a nice sizzling sound when it hits the pan. If you don't, your heat is too low. Add the reconstituted dried mushrooms and HALF of the fresh mushrooms to the pan, along with at least a tablespoon of fresh thyme leaves, salt and fresh cracked black pepper to taste. Now you are ready to start adding the stock, ladle by ladle, to the pan. Add 1 or 2 ladles (about 1/3 cup) at a time to the rice and stir until it is absorbed. Keep adding the stock, stirring until it is absorbed before you ladle in the next addition. The whole process is going to take about 30 minutes. After about 20 minutes, start tasting the rice. When it is done it will be tender but still somewhat firm. You may not need all the stock. I like to end with a ladle of stock so the risotto has a somewhat loose consistency before I add the cheese. When the rice is done, add in the squeeze of lemon juice, and the cheeses and stir well. Taste again to adjust the seasonings. I like to sprinkle in more thyme at this point. 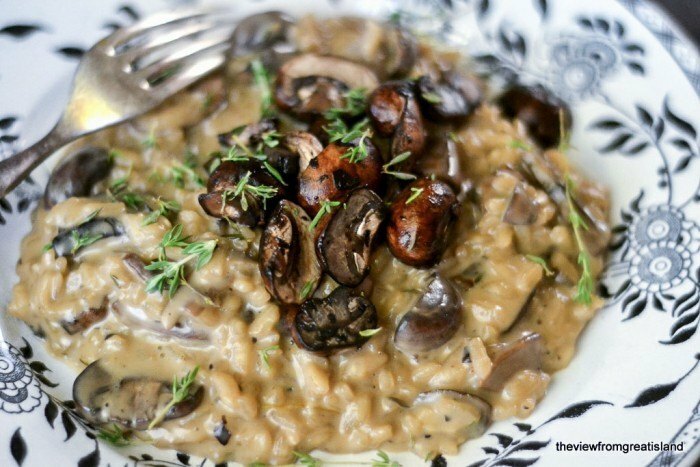 Plate the risotto right away, and top with the remaining fresh mushrooms and more fresh thyme.